U.S. President Donald Trump and Brazilian President Jair Bolsonaro during a news conference in the Rose Garden of the White House, Washington, March 19, 2019 (AP photo by Evan Vucci). 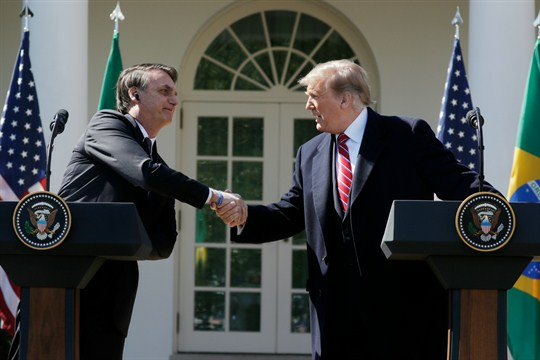 In a sign of the high value he places on forging closer ties with Washington, Brazilian President Jair Bolsonaro made the United States his first bilateral trip overseas as president last month. At a meeting with President Donald Trump at the White House, the two liked-minded leaders agreed to deepen cooperation on a wide range of issues, and Trump announced his administration would designate Brazil as a major non-NATO ally. In an interview with WPR, Guilherme Casarões, a professor of comparative politics at the Getulio Vargas Foundation in Sao Paulo, explains the ideological origins of Bolsonaro’s charm offensive and why many Brazilians don’t see long-term benefits in entangling themselves with the U.S.